An Iranian gunboat pointed its loaded machine gun at a U.S. Navy helicopter flying over the Gulf of Hormuz on Nov. 25, U.S. defense officials said. In the latest of a series of incidents between Iranian and American forces in and around the Persian Gulf, the officials told Fox News that two Iranian small boats were spotted approximately nine miles from the USS Eisenhower aircraft carrier while it was transiting the strait. After spotting the Iranian gunboats, the aircraft carrier launched a helicopter, which had been on alert, according to the officials. The helicopter flew close to the Iranian small boats, where one of the Iranian vessels pointed its weapon at the helicopter and the pilots reported seeing that the machine gun was loaded, they added. 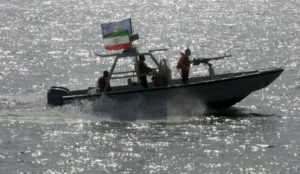 In September, the Navy said Iran had threatened two American maritime patrol aircraft flying over the Strait of Hormuz. That incident occurred a week after a U.S. Navy patrol ship was forced to change course after a fast attack craft from Iran’s Islamic Revolutionary Guard Corps (IRGC) came within 91 meters of it in the central Persian Gulf.